News Around Town: About 1 in 8 U.S. women will develop invasive breast cancer in her lifetime and though the odds of men developing breast cancer are less common, it does happen. Early detection through regular checkups is paramount in the fight against breast cancer. 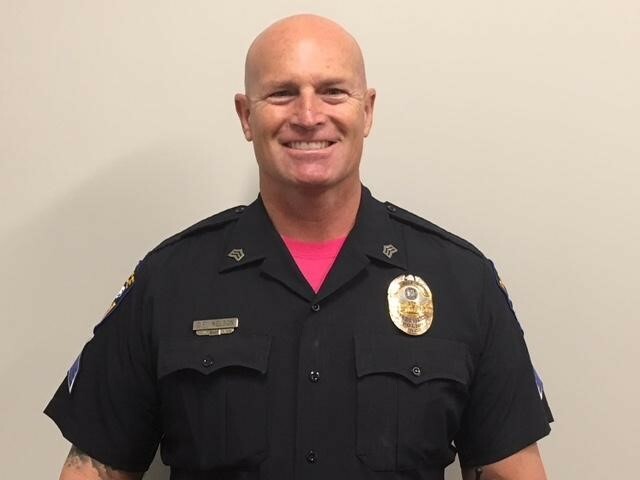 This year the Matthews Police Department is doing their part to raise awareness by wearing custom Pink ‘n Blue tee shirts under their uniforms (with permission from the Chief, of course) for October, National Breast Cancer Awareness Month. If you want to help their efforts, the shirts are also available for the public for purchase (cash only; small to XL $16, XXL are $18) with proceeds going to the Novant Health Mobile Mammography Unit to help fund checkups for women who can not afford them. Matthews police will have a pop of color in their uniforms this month to draw attention to the need for early breast cancer screenings. Photos courtesy of the Matthews Police Department. News Above Town: In a cruel weather joke, temps will reach 90 today. If you have a good relationship with Autumn will you ask it to please come back to Matthews? We’re looking forward to a looooong visit. The seasons may be confused but the sky is on point. News About Town: This week a jury in Rowan County Criminal Superior Court found Gerardo Juarez, a Matthews resident, guilty of four counts of felony trafficking (heroin by possession and transportation) and one count of felony conspiracy to traffic (heroin by possession and transportation). Judge David Hall sentenced Gerardo Juarez to two consecutive sentences (totaling at least 37.5 years) and ordered a mandatory minimum fine of $500,000. Juarez and Darya Sergeyevna Borovskaya, also a Matthews resident, were arrested in an undercover operation in Salisbury in 2017. One Fun Thing: Join the Matthews Library for Family Storytime today (and every Thursday through the end of the month) at Squirrel Lake Park! One of talented Matthews librarians will be on-hand telling stories, singing songs, and leading activities. Squirrel Lake Park, 1631 Pleasant Plains Rd, Matthews, NC 28105. Meet at shelter A.